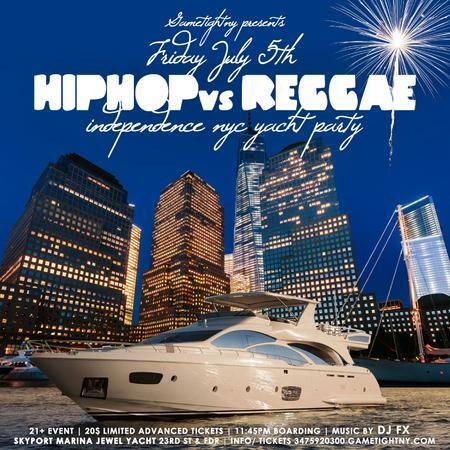 Friday July 5th, 2019 – NYC Hip Hop vs. Reggae July 4th Weekend Cruise Yacht party at Skyport Marinas Jewel Yacht located at 2430 Fdr Drive Service Road East New York, NY 10010. Join us at the Hottest Hip Hop vs. Reggae Independence Day Weekend Friday Cruise in New York with NYC Hottests Djs Each & Every other Friday! Group of 5ppl discount 75$. Groups of 5 Ladies Champagne with Admission 100$. Boarding begins at 11:45pm and returns approx. 4am.